Total Car Diagnostics Total OBD & ECU Auto Diagnostics Software (TOAD) + ELM327 is a Scam and Rip Off…. Don’t Buy! If you’re thinking of buying Total Car Diagnostics otal OBD & ECU Auto Diagnostics Software (TOAD) + ELM327 it is a scam! This company charges $400 for software that can be downloaded right from your computer, but they mail out a physical CD with your order, so you have to return the physical CD, to Australia, by first class mail, in order to get your refund. And if you look at his responses back to the customers, EACH one is negative and puts down the buyer! Dozens of people have reported it on amazon, saying how they had to spend a ton of money to send back their CD, or else they wouldn’t get their $400 back… and yet it was a lot of money to mail the CD back, because they required you to send it first class. 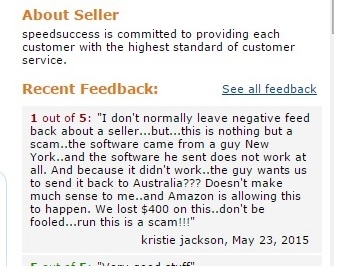 There were dozens others on this Amazon account, but the owner switched pages and the site is taken down. Avoid Total Car Diagnostics Total OBD & ECU Auto Diagnotics (TOAD) software at all costs unless you want to waste $400… because they will not give you your money back unless you mail, first class, a physical disk to them that’s not needed.